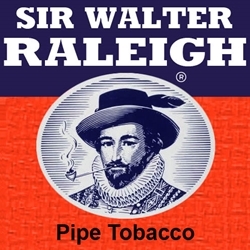 Sir Walter Raleigh Pipe Tobacco has been a long-time American favorite since 1927. Made with fine quality blends of Burley and Virginia high quality tobacco. The Sir Walter Raleigh original tobacco blend is mellow and lightly fragrant, perfect for an all-day smoke. The Sir Walter Raleigh aromatic tobacco blend has a sweeter flavor and aroma to please the pipe smoker, and anyone else in the vicinity. Sir Walter Raleigh Pipe Tobacco is distributed nationwide by Scandinavian Tobacco Group, Copenhagen, Denmark. Each pouch of Sir Walter Raleigh Pipe Tobacco are available at our online tobacco store in unique styles to choose from. Currently available: Regular and Aromatic flavors. Here at Smokers Discounts we offer you a great way to relax and enjoy a great quality smoke at an inexpensive price. Sir Walter Raleigh Pipe Tobacco is an excellent choice for your pipe smoking needs. Our online tobacco store was created to make it easy and affordable to buy pipe tobacco online. Call us for more details!